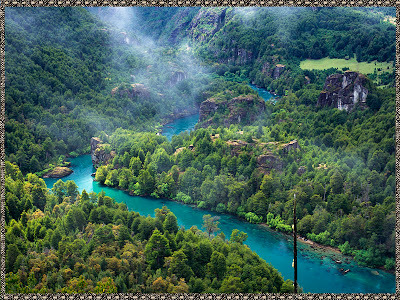 Patagonia Under Siege: Barrick Gold Rains Money on Chile's Huasco Valley ($60 million usd) what will Kinross Gold & Geocom Resources pay for the Futaleufu River Valley? Barrick Gold Rains Money on Chile's Huasco Valley ($60 million usd) what will Kinross Gold & Geocom Resources pay for the Futaleufu River Valley? (July 12, 2005) In an effort to calm environmental concerns brewing because of the construction of the planned Pascua Lama gold mine, the Canadian transnational Barrick Gold Corporation has signed a protocol agreement with the Huasco Valley Board of Overseers addressing environmental issues such as the drainage of acidic waters and the effects of relocating nearby glaciers. 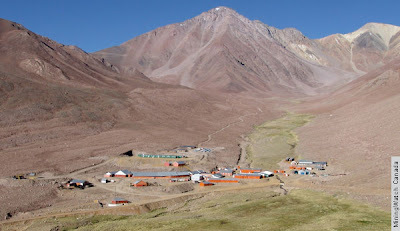 The Pascua Lama mine, which straddles Chile’s Region III and Argentina’s San Juan Province, has reserves of 17.6 million ounces of gold and silver deposits and is meant to begin operations in 2009. In the unpublished agreement signed June 30, the company Minera Nevada, an affiliate of Barrick, commits to providing funding of US$60 million to address negative concerns regarding the construction of the mine and ongoing environmental problems. The $60 million will be doled out at US$3 million per year for the next 20 years. The money will be used to provide compensation packages to cover indirect effects that could result from the mining, according to Huasco Valley Board of Overseers executive Iván Pavletic. In this sense, the money would be directed at water infrastructure projects, investment, and ends that will be established by the local Board of Overseers. Barrick will also carry out environmental evaluations of the drainage of acidic water caused by the mine and the relocation of three glaciers in the Andes Mountains that will be necessary for accessing the open-pit mine. Barrick’s original plan was to transfer 300,000 cubic meters of ice with a 20-hectare surface area from the glaciers that surround the deposits (ST, March 31). To mitigate ecological impact and prevent ice from melting, Barrick hopes to transfer the three glaciers, Toro 1, Toro 2, and Esperanza, to an area with similar surface characteristics and elevation by merging the three into a larger glacier, Guanaco (ST, June 1). Glacier specialists from France, contacted by the Board of Overseers, are expected to arrive in Chile today, Tuesday, to begin studies on the glacier relocation, as outlined in the protocol agreement. Barrick will also fund this study. Although environmental organizations are primarily focused on the effects of glacier relocation, it is not the principal environmental concern being addressed in the protocol agreement. Instead, Pavletic says, the acidic water drainage is much more important. Because this project involves the exploitation of a mountain and the creation of sterile deposits, there is an effect on the mountain range’s drainage system of water, rain, and water from snow, Pavletic says. The level of acidity is already high in the Huasco River, and will naturally be higher with the drainage of water from the mine. In the agreement, Barrick promises to look into the best way to prevent contamination of the river. Earlier this year, farmers in Region III protested the Pascua Lama gold mine because they fear the water supply they rely on for irrigation will become contaminated (ST, March 7). The Huasco Valley Board of Overseers is likely Barrick’s most important counterpart because it is aligned with 2000 farmers that use the Huasco River and its tributaries. And at the moment, this is very important for the Huasco Valley, where people are experiencing an economic upswing with the construction of the Santa Juana reservoir, which has increased horticultural production of olives and the exportation of grapes and olive oil. In the agreement, Pavletic says Barrick proposes a series of mitigating measures. There is talk of an Andean reservoir at the base of the Carmen River, a system of 30 automatic water-quality monitoring stations, and the construction of a retainer wall for filtration of acidic drainage in underground water from the mouth of the Estrecho River. Pavletic says the report does not resolve all of the issues that still exist with the mine and the future of the water balance, the treatment of acidic waters, and the glaciological impacts. However, he admits that this is a historic landmark. Barrick’s commitment to spend over US$60 million will begin with the arrival of French glaciologists this week.